12.100.000 Nm – new record! 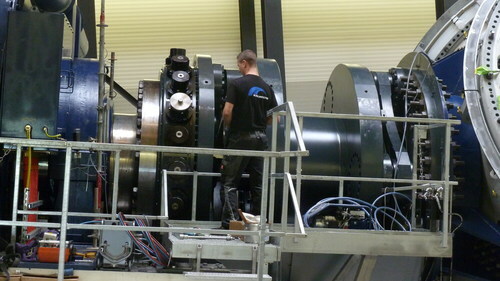 The biggest ever build MALMEDIE Safety-Coupling was installed and commissioned in August 2015. With an astonishing shut-off torque of 12.100.000 Nm, the Safety-Coupling protects a test bench for wind turbines against overloads in a safe and reliable way. 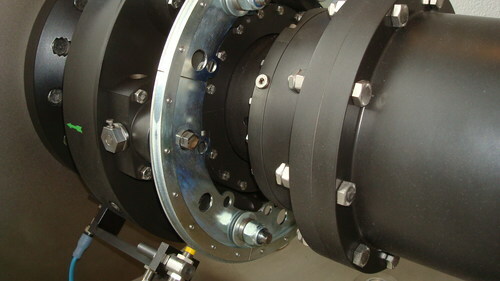 At a diameter of 2.5 meters, 21 Safety-Elements type "ASE40" are installed. 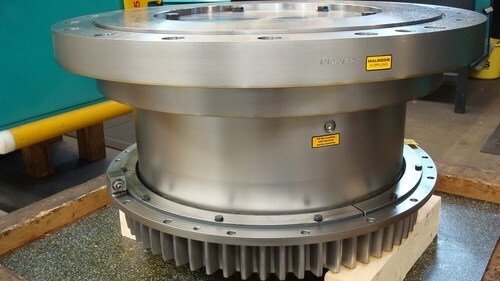 Additionally, the coupling has provisions to add another 3 Safety-Elements, increasing the shut-off torque to even 14.000.000 Nm. Single Safety-Elements can be also de-activated with a special tool, so that the coupling can be operated also with less Nos. of Safety-Elements. That results in variable shut-off torques between 1.728.500 Nm and 14.000.000 Nm. As usual with all MALMEDIE Safety-Couplings, the Safety-Elements can be re-engaged after a coupling trip simply and fast with a plastic hammer. The test bench can test complete assembled machinery houses of wind turbines of the 5-10 MW class - which is quite new, because so far single component test of wind turbines have been the standard in that industry. No matter if shredding, crushing or breaking is the task, the operators of those machines desire a robust and easy to operate technology and at the same time a reliable safeguarding against overloads. – but from today´s point of view, the replacement of the broken Torque-Tube after an overload event means a considerable long downtime. 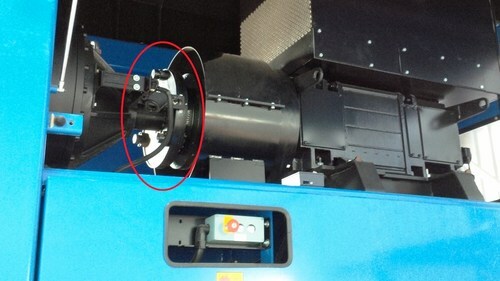 Together with the customer, Malmedie developed a solution with a Safety-Coupling to replace the existing Torque-Tube. Due to the same mounting dimensions, it was a 1:1 replacement, i.e. nothing needed to be modified at site at all. Now, after an overload event, no new parts need to be fitted and the recommissioning time is reduced from hours to minutes only. Maximum equipment availability is of highest priority with one of our Hot Mill customers, specifically on hot levelling machines. Downtimes after overload situations need to be reduced as much as possible. 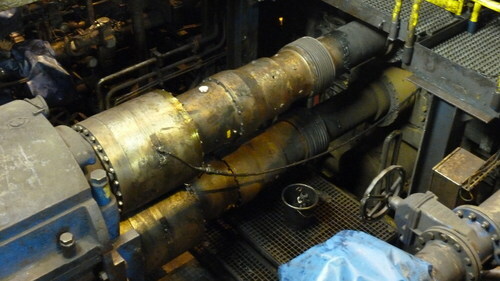 Having already experience with Malmedie Safety-Coupling and the short re-commissioning times, the customer decided to upgrade the existing couplings with automatic re-engagement devices to reduce downtimes even further. Now the coupling can be remotely re-engaged simply by pushing a key in the operating room. 30 years of operation - no problem! 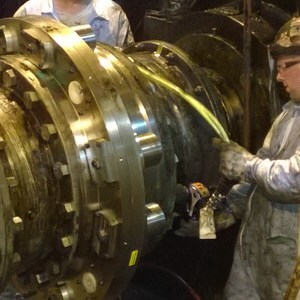 After 30 years continuous operation of a Malmedie Gear-Coupling in a vertical roughing mill in Belgium, some parts needed replacement for the first time due to wear. Even after such a long time it´s not a problem at all for Malmedie to supply single spare parts accordingly. 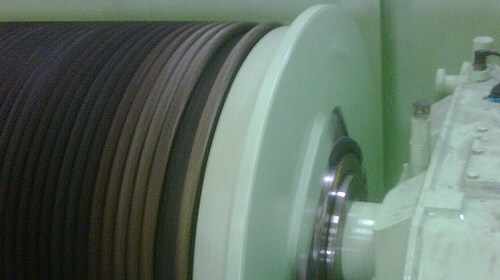 A smart design, the use of high-quality materials and a good maintenance is the guarantee for a long service life. Unhappy with competitor´s product - change to Malmedie! Sometimes decisions appear to be completely wrong afterwards – like in case of a Port Operator in Asia. Nine big STS container cranes were initially equipped with competitors Drum-Couplings at the Boom Hoist. After a short operational time, the first problems appeared – and the Port Operator did not issue the final acceptance of the cranes. 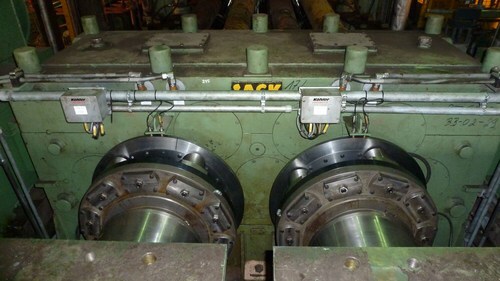 All couplings were changed then to the original (Drum-Coupling) of Malmedie, and ever since the cranes are running trouble-free. Sometimes customer requirements are a real challenge – like in case of Gear Joint Spindles for a hot rolling mill in Germany. The so far used products of a competitor were showing after only a few months of operation cracks and heavy wear. 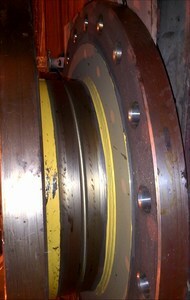 But the operating conditions have been also extreme in terms of high torques at small diameters. Together with the customer and with the aid of FEM design / simulation, Malmedie developed and installed an optimized version – at full customer satisfaction. Known as to be the first Safety-Coupling / Brake based and non-hydraulic Snag Overload Protection, the SOS is reaching new sales records. More than 150 units have been sold for Ship-to-Shore cranes all over the world by May 2016.